The discounter is greedy for more market share as it opens up 80 more stores. The Germans are coming, again. The supermarket discounters shaking up the sector have continued their relentless growth – recent data from Kantar Worldpanel had Aldi and Lidl’s sales up 13.7% and 18.7%). Now Aldi is opening 80 new stores as part of its expansion plans in the UK, creating 5,000 new jobs. Bad luck Tesco and co. The German-owned firm currently has 28,000 workers across more than 600 stores in the UK and the goal is to up the number of outlets to 1,000 by 2020. It’s obviously not great news for the likes of Tesco, Asda and Morrisons, already knee-deep in a price war in an attempt to fight off Aldi and Lidl. But the locations of some of the new stores suggest another retailer might be glancing over its shoulder soon too. 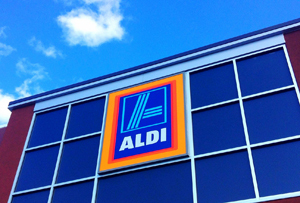 The new wave of Aldi stores is targeting towns in middle England with openings in Poynton, East Cheshire, Eastbourne and the Establishment's favourite town of Chipping Norton in the Cotswolds – firmly in Waitrose territory. The upmarket retailer's 0.1% growth for the 12 weeks to January 31 was a damn sight better than Tesco's, Morrisons' and Asda’s shrinking sales, but it was still way down on what it used to be. Not content with the market share it’s nibbled away from other supermarkets, Aldi is trying to reel in as many new customers as possible by targeting more middle and high income shoppers. While 5,000 new employees may seem like a big ask, Aldi has made a few concerted efforts to draw in talent. In February, it increased staff wages to a minimum of £8.40 an hour (£9.45 an hour in London), higher than the national living wage. One blemish on Aldi’s recent progress has been criticism from analysts about its latest advertising campaign. Aldi had said it would cut prices in response to Morrisons’ latest ‘price crunch’ promotion – and pointed out the differences in price among products such as Aldi’s Norpak butter and a Lurpak tub from Morrisons. The tactic of comparing price per pack meant there was no distinction between brands, organic or premium lines. Bernstein analyst Bruno Monteyne said if both supermarkets’ own-branded goods were stacked against one another, Morrisons had closed the gap. He argued that it was a ‘defensive and arguably misleading advertising campaign by Aldi’, while Clive Black at Shore Capital said there were ‘inconsistencies and outright misconceptions at play’ in the advert. Monteyne expects the discounter’s growth to continue, but said it would ‘largely be due to space growth rather than making customers switch to existing stores’. Either way, it's not going to be welcome news for the rest of the UK's struggling supermarkets.